Hampton Inn & Suites, Skokie Make your day hotel stay enjoyable and comfortable by booking your day stay at Hampton Inn & Suites, Skokie. Just 20 minutes from downtown Chicago, the North Shore area is a collection of charming communities, parks, and cultural activities. Our Hampton Inn & Suites hotel in Chicago-North Shore/Skokie puts you in the middle of it all. Were five miles away from Northwestern University. Our hotel in North Shore/Skokie is just one block from the fashionable Old Orchard Shoppingtown, which features stores such as Nordstroms, Bloomingdales, and Lord and Taylor. From numerous historical attractions to an abundance of dance, music, and theater, the area around our hotel in Skokie is full of things to do. So come to the Hampton Inn & Suites hotel in Chicago-North Shore/Skokie, a retreat just minutes from the Windy City. Book your stay at the Hampton Inn & Suites Skokie with HotelsByDay today! The Hampton Inn & Suites Skokie is conveniently located in the charming North Shore suburbs of Chicago with easy access to Edens Expressway (I-94). Just 16 miles to downtown Chicago, the Hampton Inn & Suites is a close retreat from the hectic city center. Northwestern University - For visiting families, guest lecturers, and visitors to the school, Northwestern University is less than five miles from the hotel. The private university is based in Evanston and is widely regarded as one of the top research institutions in the US. Skokie Northshore Sculpture Park - For lovers of the arts, the Skokie Northshore Sculpture Park is a gorgeous outdoor sculpture garden with an impression collection and well-maintained grounds that are great for sunny days. North Shore Center for the Performing Arts - Catching a show later on? The hotel is close to the North Shore Center for the Performing Arts in Skokie. The complex has two theaters and hosts a variety of popular performing arts, creative education, and concerts throughout the year. Guests can check out the center’s calendar of upcoming events here. Whether you need a place to rest for the day or a home base in the city to get some work done, the Hampton Inn & Suites is ready to make your day stay in the Skokie area as convenient as possible. Book your day package at the Hampton Inn & Suites Skokie with HotelsByDay today! Parking Details - Free parking is available at the hotel for hotel guests. General Hotel Amenities - The Hampton Inn & Suites has a full range of amenities to ensure your needs are fully catered to during your intra-day stay. The hotel offers laundry/valet service, luggage hold, and room service for travelers. The multi-lingual staff is available to help arrange local area transportation, as well as assistance coordinating guest recreation activities. And if you forget anything at home, the on-site gift shop stocks all the essentials you might need during your day stay. Business Travel Friendly - For business travelers, the Hampton Inn & Suites has a full service business center with complimentary printing service, express mail, fax, meeting rooms, photo copying service and more. For presentations, the hotel has audio/visual equipment available for rental. 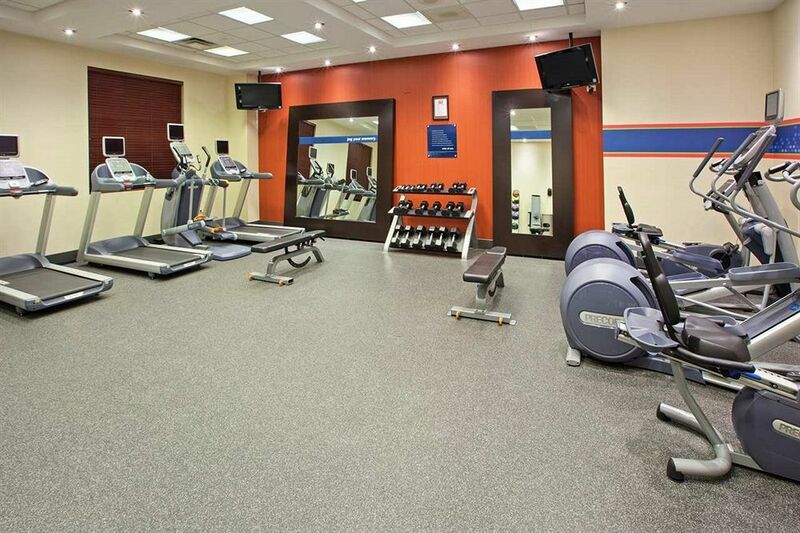 Staying Fit - For guests’ convenience, the hotel has a well-equipped fitness room if you want to blow off some steam. There is also an indoor pool open throughout the year for anyone looking to take a swim during their stay. In Room Amenities - The 225 guest rooms and suites at the Hampton Inn feature free high speed internet access for anyone setting up a temporary work station for their day stay. If you’re just looking for a place to rest, the hotel’s signature Clean and Fresh Hampton Bed® is ultra-comfortable.